Sean Darrell Isensee died in 2013 during a mental health crisis. Sean had developed bipolar disorder and generalized anxiety disorder in his late teens. He struggled with that for the rest of his life. On the last day of his life, when he needed the best type of response from emergency responders and others, he did not get it. Instead, he was shot and killed by a police officer. Our foundation works in his memory (and those of others like him) to prevent similar tragedies. There is no lack of work to do in our mission. We started in Sugar Land and are now reaching out to other communities. We hear too frequently of police responses that have ended in injury or death, often to unarmed citizens. We know police often face difficult and dangerous situations when confronted with someone in a mental health crisis. That means they need all the training, equipment and support they can get to enable a safe response for all. We want them to be safe as well. 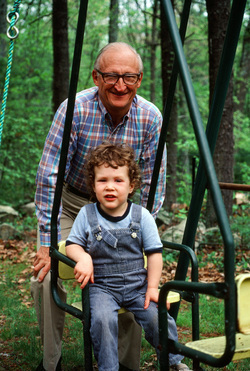 Sean Darrell Isensee as a child with his grandfather. We qualified for our IRS approved status as a non profit organization in 2013. So your contributions are tax deductible. Our Official name is the "Isensee Foundation for Safe Police Response." For further details contact debbie.isensee@gmail.com or call Debbie at 281-782-4550.